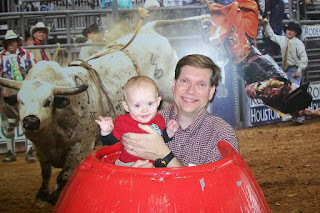 Our family visited the Houston Rodeo for the first time. 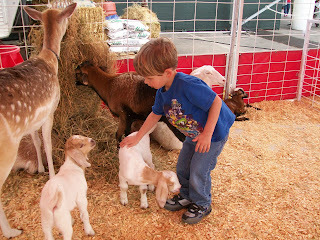 While there were a lot of neat, educational animal exhibits, Dawson was preoccupied with the rides. He just wasn't as enthused with all the animals as he was with the carnival rides. And of course the rides are outrageously expensive and extremely underwhelming. 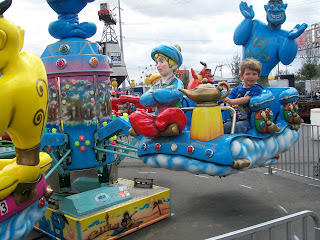 We could buy a ticket to Six Flags (which has a bigger variety and more exciting rides) for what it cost to ride just a few of the carnival rides. So our personal experience was pretty disappointing. There were a lot of great things at the livestock show, but Dawson wasn't overly interested in them on this particular day. And the carnival is a HUGE ripoff!! 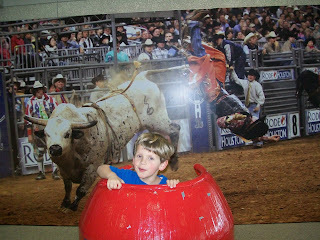 Anyway, here are a few pictures from our day at the rodeo. Petting a baby goat at the petting zoo. 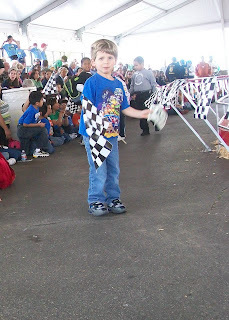 Waving his flag at the crazy animal races. 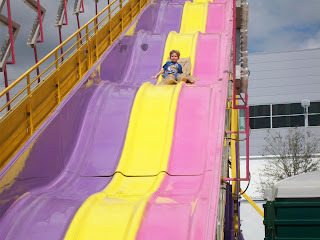 Going down the big slide! Going around and around on the Aladdin ride. 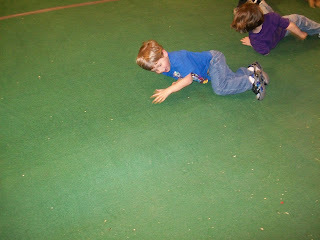 Dawson had so much fun rolling down this hill that was set up inside the arena. Randy and Brady inside the barrel. Dawson acting silly, popping up from inside the barrel, only to disappear inside of it, and pop back up again.